Wallets an important part of my life. It not only defines my personality but also provides me the necessary convenience to store my valuable cards and belongings. The wallet is not just a style statement. It also reflects a persona of an individual and defines his taste in luxury and versatility. It serves as an important accessory to hold onto which projects a person’s sense of style and composure in front of the others. When you take out your wallet to pay for something or show any identity card, it leaves an impression on the other person. At present, there are probably thousands of companies that make wallets for the people, but only a few are attractive and worthy enough to purchase. As a person, a wallet is an integral aspect of my life as I keep my cash, coins, credit cards, driver license, identification cards, business cards, etc. to facilitate me at every point. The importance of wallet is too much for me. I lay special emphasis on design, features, and functionalities of the wallet I keep. I have been looking for an impressive wallet for some time and browsed many websites selling wallets boasting about their features and design. Finally, I stumble upon https://cuirally.com/stark/. I found wallet named STARK which caught my attention in the first look. I was in awe of its flawless design, appearance, quality, and features. So, I bought one, and I was surprised to see that it was exactly the same wallet that I wished to purchase and presented to me by CuirAlly.com. So, I thought about writing a review about it so that people can know the brilliance of this wallet. When you first look at the wallet, it doesn’t fail to project a variety of range of variation that you would expect from a good bi fold wallet. Just like the looks, its features are phenomenal. It is not an average bi fold wallet. STARK wallet is more than what meets the eyes. It has a good size with great card capacity and impressive color scheme which presents it as a promising wallet. STARK is a super slim wallet which is designed to handle the common issues people face with fat bulging wallets which are a nuisance to carry in the back pockets of our pants. With STARK, Cuir Ally has come up with a great solution to this problem. It doesn’t just have a beautiful design, but great features too. The most important aspect is its RFID theft protection which prevents RFID from your Credit, Debit and ID Cards. We will discuss this feature later in our review. Now let’s look at the design of the STARK wallet. 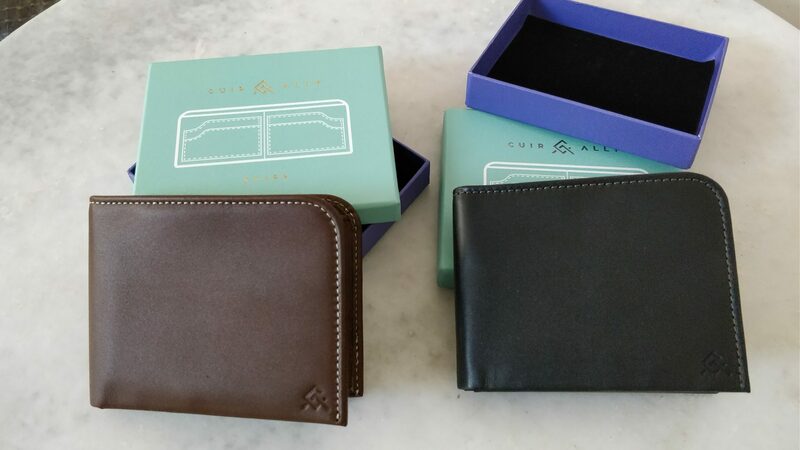 The major difference between STARK wallet and other bi-folds is the significant variation is the design with an eclectic range of colors which appeal to the majority of people looking for a good looking wallet. Its thickness is mere 6mm, and it has a very sleek profile design. At present, it is projected as World’s Slimmest Unisex Wallet. That means it is an ideal choice for men and women alike who wants to leave a mark on other people with their style statement. Its surface is smooth and soft which gives it a royal feel. Its design is perfectly crafted to fit in most of the pants that people wear. It is made of premium fine grain leather which gives a feeling of luxury as well as style. Holding this wallet will make you feel delightful every time you use it. It has a design philosophy that people can store that frequently used items at priority spaces while low priority items can be stored in other sections. License, Credit Cards, Debit Cards, ID cards can be stored in the rear card slot as they are not used frequently. At the same time, it has two extra long dimension card slots present in the rear section which are perfectly placed to store business cards as well as laminated ID cards. The design of this wallet is carefully crafted according to wallet holding pattern of people. Most the wallets are held with thumb and index finger. STARK has carefully embodied this aspect in its design. This design feature of STARK wallet makes it stand out of the crowd. It provides seamless card usage experience. The wallet is precisely designed to hold all types of notes of all major currencies. People often get trouble in fitting currency notes in the wallet which leads to the folding of notes and crumbling. STARK wallet has laid special emphasis on this aspect so that people don’t have to struggle to put their notes in the wallet. Coins are also necessary for our daily lives but keeping them can be quite hard. Most of the wallets get damaged and bulkier. They often fail to store the coins, and many times the coins fall from the wallet. In this case, STARK wallet has introduced a unique solution of coin slot cover. It has a pull flap which provides easy access as well as safe storage of coins. In most of the wallets, they have buttons for coin storage unit. But in STARK wallet, there are no buttons which makes it look more trendy yet makes it easy to store coins. STARK wallet has a minimalistic design. An average person doesn’t use more than 4 cards on a daily basis. It often includes 2 Debit cards and 2 Credit cards. This wallet takes this aspect into consideration and makes sure that there is no clutter in the front section. Now coming to the most important feature of this wallet. RFID card theft has increased a lot in recent time with people losing their Credit Card, Debit Card information due to malicious users. STARK wallet is not just about a feel-good wallet with great design. It has an integrated RFID protection membrane which is present in its wallet. This membrane essentially blocks every RFID signal that incident on your wallet. Hence, this wallet prevents any RFID card theft. STARK wallet is not just a regular wallet with average design and functionalities. It is an awesomely designed premium wallet made out of superior quality grain leather which gives it a unique look. This wallet is perfect for both men and women. It is touted as the slimmest wallet available in the world. Needless to say, it has embodied all the important design aspects which makes it more attractive to people who see it. It acts as your personal style statement and showcases your taste in finesse and luxury. It is perfectly designed to keep notes of major currencies. It has ample space to store Credit and Debit cards along with your business cards and ID cards. Its coin storage is designed to keep them safe from falling over. It has a minimalistic design and hence doesn’t feel like a cluttered wallet. The most important aspect of this wallet is its RFID card theft protection which makes it more appealing to buy. I personally recommend this wallet as it has all the required features and functionalities which I expect from a premium wallet. I am in awe of its design and build material, and it certainly gives me a special feeling of owning a great product.